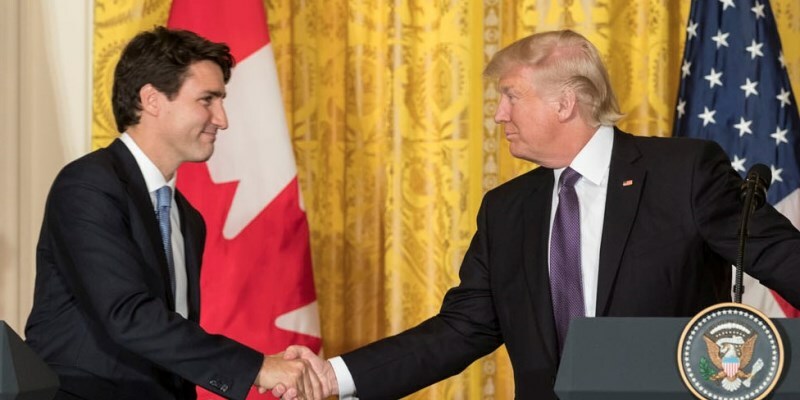 Canadians owe Donald Trump a debt of gratitude for repeatedly referring to our average 270 per cent tariffs on dairy products coming into—or trying to come into—this country. For many Canadians, that’s probably the first they’ve heard of supply management, the legalized cartels we established in the early 1970s because our dairy and poultry farmers couldn’t abide competition from other provinces. But we’re not the only country that interferes with trade. If our prime minister wanted to tweet back accusations, which probably wouldn’t be a good diplomatic strategy with this president, he’d have no shortage of ammunition. If you find the table I linked to bewildering, you can read two-page country summaries here. Each summary comes with a colour-coded chart showing the country’s score in each of 22 service industries, what accounts for it, and how it compares with the average score of all the (mainly rich) countries the OECD looks at. Cut to the chase: the U.S. has a higher score than the OECD average in seven industries out of 22. But this index is like golf—lower is better. When your score is higher than the OECD average that means your rules about allowing foreigners in are more restrictive than the OECD average. By contrast, Canada is more restrictive than the OECD average in only six industries. By that measure, at least, both our countries do well compared to the OECD average but we actually do slightly better than the U.S. Put that in your Twitter feed and smoke it! If you compare our score with the U.S. score in each of the 22 industries, the results also favour us. There are two industries where the two countries have essentially the same score (sound recording and computers). In the other 20 industries, the U.S. has the lower (i.e. better) score in just seven of the 20 while we have the lower score in 13—which if you’re counting, Mr. President, is almost twice as many. If you take an average across all 22 industries (which you probably shouldn’t do, at least not without weighting the industries by importance, which I haven’t done here) our average is 0.225 and the Americans’ is 0.232. We do better again. Just sayin’. True, the U.S. has the single lowest score among all the industries across the two countries—just 0.124 in telecoms. (Our telecoms score is 0.333, which probably helps account for our telecoms prices. Our lowest STRI is 0.152 in road freight transport.) But the U.S. also has the highest STRI, 0.534 in air transport, where the main problem, the OECD’s country note informs us, involves restrictions on foreign ownership of airlines. The infamous Jones Act, which restricts port-to-port maritime shipping to U.S. carriers, produces a high score of 0.371. Our score in air transport is also high—0.401, our highest score for the 22 industries. Our score in maritime transport is just 0.190. In sum, this is an index where Canada does better than the U.S. According to the OECD’s numbers, we’re less trade-restrictive in services than they are. I wouldn’t expect the White House to take these numbers lying down, if ever they came to its attention. Anyone who has tried to put an index together understands there are almost infinitely many ways to do it. Moreover, many of the restrictions the OECD is trying to measure don’t readily lend themselves to numerical capture. But these numbers are better than no numbers. And they’re by no means fake numbers. Which means that if the U.S. wants to get to pure free trade, as the president says it does, it has work to do, too. Best we lower the volume and all get on with it.